Did your ClassenSAS student give you the following printed handout (PDF) yesterday afternoon or last night after school? If not, please print this PDF version out! 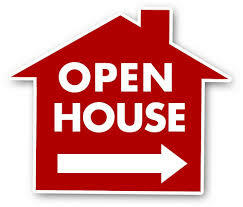 Have your student complete it later today or tonight so you’re ready for our schoolwide open house on Thursday, August 22, from 5 – 8 pm! We want to meet you! 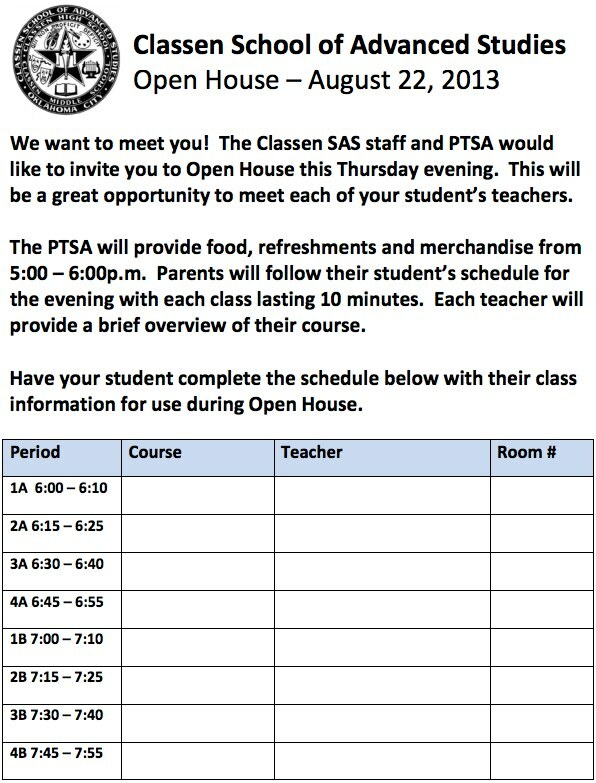 The Classen SAS staff and PTSA would like to invite you to Open House this Thursday evening. This will be a great opportunity to meet each of your student’s teachers. The PTSA will provide food, refreshments and merchandise from 5:00 – 6:00p.m. Parents will follow their student’s schedule for the evening with each class lasting 10 minutes. Teachers will provide a brief overview of their course. Each student will be given a handout with the rotation schedule for the evening. August 21, 2013 in Announcement. Maybe explain to teachers that parents coming and going may occur if have multiple students. Last year I felt like the teachers thought I was being rude….and/or disruptive. I agree, it’s tough with more than one student. We have two, but our elementary open house is tomorrow night too… so I’ll have to pick and choose between classes and won’t be able to see them all. What kind of a schedule would you suggest that could work better for parents with multiple students? There is no good answer for this. I have struggled with it for years. If you only have two, then parents can divide and conquer but if you have three or more, you have to just choose the classes you think you need to hear the most about. Parent/teacher conferences are held soon so this should help if you have questions. Good look! I made 32 parent conferences for a couple of years. Not Fun!